The third film in the hit Paranormal Activity franchise is an origin story that jumps back to the childhood of sisters Katie and Kristi by way of a convenient VHS tape. Set in the late '80s, Paranormal Activity 3 ratchets up the scare levels by uncovering the childhood terrors that led to the sisters' hauntings as adults. It's clear this background mythology has been shoehorned-in to squeeze extra money from the series, but it's easily the most well-crafted and scariest of the trilogy and it sets a high bar if future Paranormals haunt the multiplex next October. The more traditional haunted house feel and fresh focus should please diehards and pull in new fans—expect it to do brisk box office business during the Halloween season. After a brief trip to 2005 and 2006 to check in with the all grown-up Katie (Katie Featherston) and Kristi (Sprague Grayden) as they were just before the start of Paranormal Activity 2, Paranormal Activity 3 reveals VHS tapes from the girls' suburban childhood spent under the watch of mother Julie (Lauren Bittner) and her boyfriend Dennis (Christopher Nicholas Smith), a wedding videographer. While testing out a new camera for some amorous pursuits, the family home is shook by an earthquake, and the footage reveals more than just falling framed photographs. Dennis believes that he's captured a figure on the tape and that belief—coupled with some creepy creaks around the house—compels him to set up two cameras: one in the girls' upstairs loft bedroom, and one in the master bedroom. Cue ghosts. Switching the film's focus to the young Katie and Kristi (Chloe Csengery and Jessica Tyler Brown) automatically pumps up the film's thrills and chills—we know that the girls aren't just prey to an over-active imagination, and that Kristi's imaginary friend Toby isn't just a childish game. And worse, we know they won't "grow out of it"—their fates are sealed. Dennis, the great believer, takes it upon himself to investigate demonology and reads that kids are particularly susceptible to spiritual contact. Kristi speaking to something off-camera definitely isn't so innocent, and Brown admirably straddles the line between oblivious kid and conduit for evil, looking at turns bewildered and eerily dead-eyed. It's fairly obvious that directors Henry Joost and Ariel Schulman (both new to the series) had a great time making the film. They use new visual tricks to reveal the demonic entity, along with some truly inspired rigging of Dennis' basic home video equipment. His on-the-fly take on a surveillance camera, attaching it to an oscillating fan for full-room sweeps, is easily one of the best technical choices made yet in the franchise. And there's a gag set in the kitchen that's equally terrifying, impressive, and strangely funny. Schulman and Joost are best known for their Sundance smash Catfish, another quasi-documentary about Schulman's younger brother and his mysterious online girlfriend. Like the first Paranormal Activity, everyone wanted to believe Catfish was real, but in the lobby afterwards there were heated debates about its veracity. So PA3 is a natural fit: the pair are comfortable shooting a feature with both handheld and home video formats, and are comfortable screwing with their audience. However, there are a few set ups that don't have the right flow. Joost and Schulman have a passing interest in getting their characters isolated, but their reasons for, saying, kicking Dennis, Julie, and Kristi out of the house and leaving Katie in the care of Dennis' assistant Randy, ring a touch false. It's also hard to believe that as the spirits get active during the night, the girls wouldn't jump into bed with their mom and Dennis. And while the ending is the culmination of a series of escalating scares, the terror masks an conclusion that's neither sensible nor sound. The first Paranormal Activity entered Hollywood lore after costing just $15,000—the price of a used 2008 Honda Accord—and making $193.5 million, enough to recoup its costs 12900 times over. It wasn't designed for a sequel, so continuing the hit franchise meant the filmmakers must work backwards, building a foundation underneath an already-standing house. Paranormal Activity 2 jumped back a few months and then sandwiches the action of the first; this this third film starts at the beginning of the second before vaulting back nearly 20 years. Should someone slice and dice all three films to play in linearly, it's unclear how much of it would truly fit together—here, tossed-off comments from the first film come back to bite this prequel in its cinematic behind. 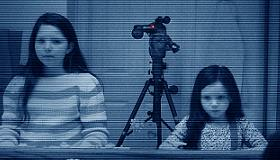 It may not all be cohesive, but the Paranormal Activity franchise has turned from a one-off chill into a real scream.